Artist Reception: Saturday, January 26th, 6 to 9 PM. Exhibition thru March 2, 2013. Artists' Reception: Saturday, March 23, 2 to 4 PM. Exhibition thru April 14, 2013. 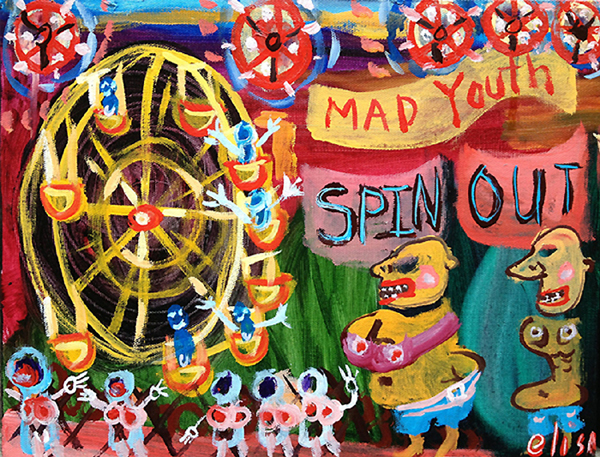 Elisa Vegliante -- "Mad Youth SPIN OUT"
oils on canvas, 17" x 14"
Art Director New Haven Free Public Library. A Catalog book with essay, written by Chris Butler & Johnes Ruta, will accompany this exhibition. Good things come in small Spaces. "Ten Narratives" is a substantial group show of Connecticut, New York, and California artists to be housed in a small East Village Gallery, Umbrella Arts, at 317 East 9th Street from January 24th to March 2nd. The exhibition explores the art of the narrative through a broad scope of styles, ranging from expressionist to surrealist to abstract to primitive, with influences ranging from Eduard Munch to Joan Miro, Australian Aboriginal art to Jean Dubuffet and Outsider Art. The ten artists comprise an interesting cross section. Half are self-taught. Ages stretch from mid-30s to mid-90s. Media include paintings, drawings, etchings, collage, assemblage, mixed media and sculpture. Some of their accomplishments include NEA fellowships, public sculpture and mural installations, and publishing children's picture books. All of these elements combine to make an exciting visual smorgasbord held together by the narrative art form. Narrative is story-telling, mimesis, poetry, or the description of allegory. It is personal. Mimesis is mime or imitation, as in the imitation of character, or the imitation of tragedy. Aristotle says that tragedy is an imitation of action. Allegory is a style of fable in which the story is a means of teaching a principle of life, a principle of personal experience or external reality, principles of Forms, or a principle of science. Narrative is drama, adventure, romance, comedy, or satire. Drama reveals a conflict between two points of fact, two types of personality, two opinions, in which the outcome is unfortunate. Comedy works with the same factors, but where the outcome is happy. As Oscar Wilde says, "The good end happily, and the bad unhappily. --- That is what fiction means." But how do we create "narrative visual art"? This exhibition explores the art of the narrative through a broad scope of styles, ranging from representative, to expressionist to surrealist to abstract to primitive, with influences ranging from Eduard Munch to Joan Miro to Australian Aboriginal art to Jean Dubuffet and Outsider Art. 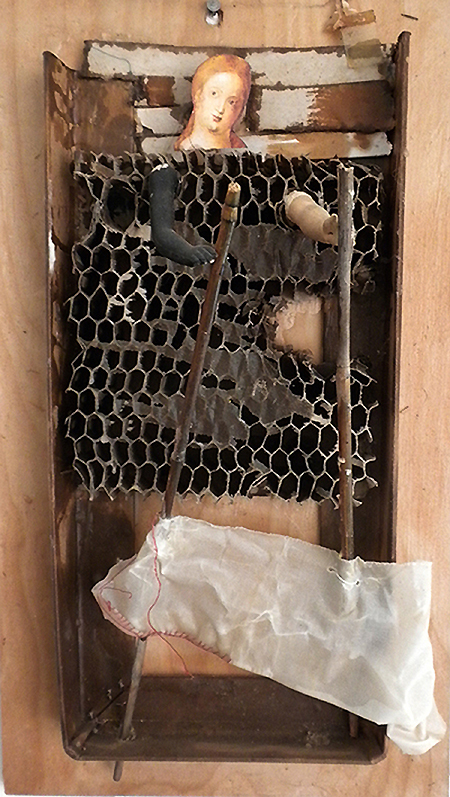 The ten artists comprise an interesting cross section. Half are self-taught. Ages stretch from mid-thirties to mid-nineties. Media include paintings, drawings, etchings, collage, assemblage, mixed media and sculpture. Some of their accomplishments include NEA fellowships, public sculpture and mural installations, and publishing children's picture books. All of these elements combine to make an exciting visual smorgasbord held together by the narrative art form. In visual narrative, stories emerge from constellations of dots and strokes of paint, points of reference, shadows and overlays, forms and images, figures and objects. -- It often requires a new vocabulary to describe patterns, motifs, moods, and emotions. Carl Jung's so-called "archetypes" lay out patterns of personalities, symbols, and myths to explain recurring principles in living reality. In 1958, the anthropologist Claude Levi-Strauss wrote in Structural Analysis that the vast number of mythic stories in the world can be distilled into certain structures that are constant and universal. A.J. Greimas points out contrasting polarities in stories, such as subject/object, sender/ receiver, helper/opponent -- the individual terms of which are characteristic representations. As the word "arche" derives from ancient Middle Eastern language as "the eldest form," (such as the architectural arch, or the study of archaeology). Archetypes, the "eldest types," denote prototypes of personal characteristics and patterns of experience from which recognizable cultural stories and references emerge. Levi-Strauss also put forth the theory that myths have a sort of "collective existence" independent of individual thought (here reinforcing the theory advanced by Carl Jung of the "Collective Unconscious") -- that diverse stories can be distilled into allegorical explanations of physical and mechanical principles and translated into moral and ethical fables. In art, narrative representations can produce the immediate recognition of stories, dreams, motifs, or myths in figurative pictures. Narrative representations can also be perceived in ideas which gradually emerge from splotches of paint, points of reference, shadows and overlays of forms and other images, which merge into microcosms and macrocosms. Dynamic representations of narrative have developed through the centuries from friezes of ancient Assyrian lion chariots, to the "kouros" form of Greek figurative sculpture in forward motion, to Michelangelo's myriad paintings on the Sistine Chapel ceiling, the portrayal of heroic Chavaliers in Baroque Dynamism, and the paintings of Goya, Delacroix, and Edouard Manet. of obsession with the work of Eduard Munch, Vincent Van Gogh and Frida Kahlo. During this time she developed her own style of painting while simultaneously realizing that she was more interested in the psychological quirks that narrate the lives and souls of a culture than in painting portraits. In 1998 she abandoned portraiture to develop complex narratives in an over-amped expressionistic style she dubbed “Mondoexpressionism”. Vegliante’s painted narratives depict whimsical scenes in nearly indescribable detail of activity. “Mad Youth Spin Out” for instance, packs in an array of simultaneous actions occurring at the scene of an amusement park: two depraved adults and a line of young girls wait their turn to go on the Ferris-wheel, the buckets already spinning full of other kids whose arms are waving in excitement. The girls standing in line are crudely depicted with bare breasts suggesting the onset of puberty and, ultimately, the loss of innocence. 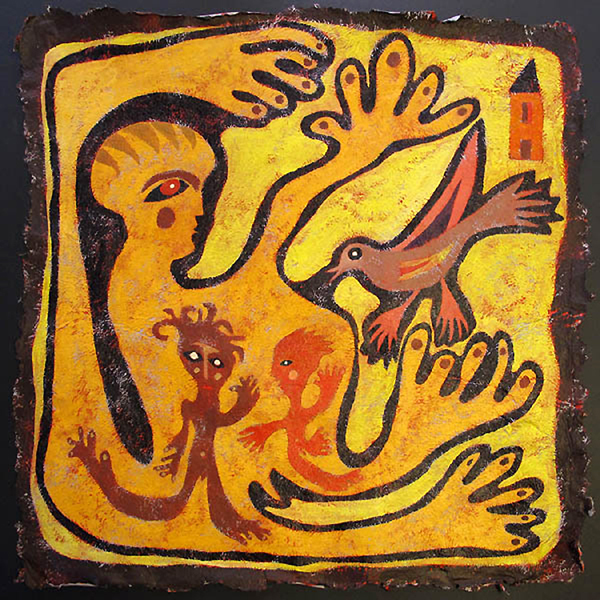 "Carlos Defending the Children from the Chickens"
ceramic wall sculpture, 30" x 30"
Claudine Burns-Smith's narratives relate to her love of family, mythology, and primitive cultures. A painter, potter and sculptor, Burns-Smith is from Paris and moved to the US in 1970. A self-taught artist, she lives and makes art in Hamden, Connecticut using mediums that include handmade paper, acrylics, paper pulp, clay and cement. As a child, she inherited from her father an interest in ancient civilizations, mythology and primitive cultures. In 1972 she moved to Colorado and studied the folklore of the Southwestern tribes and the symbolism of their designs. During a stay in Mexico, she wove textiles and made baskets in an attempt to better understand the culture. She visited Olmec and Aztec ruins and became very interested in their low-relief stone carvings. At the same time she became interested in the theories of Carl Jung and attended lectures on world mythology by Joseph Campbell. She also spent time in the South of England, collecting old Celtic legends about man-made hills, White Horses and ruins of the region. She visited Stonehenge and the Standing Stones of Carnac in Brittany. acrylics, house paint, spray paint, on fibre mat board, 42" x 48"
Gordon Skinner of Woodbridge, Connecticut, comes from a fashion design background. His "masks" are wildly Dubuffet + Basquiat. Skinner's art falls within the litmus of an identity in crisis. As a young African-American, the frustration felt by the artist at his lack of ownership in our society is something that is centuries old. He is part of a group that feels fragmented, colonized and lost. As Skinner puts it "I feel robbed of my heritage and culture". To vent that frustration and sense of invisibility, he began painting figures in colorful masks that represent both concealment and expression. Portraits of the members of Skinner's fictitious "Gohar Tribe" are brought to life through the artist's signature blend of bold color, spontaneous brushwork, and a world of hard-edged life experiences. Personal and universal revelations lie behind the visages. copper sculpture, 20" x 15" x 30"
Cherie Tredanari is a 94 year old New York bohemian whose narratives tell the stories of the Age of the Enlightenment: a series on scenes from Cervantes' Don Quixote de La Mancha, Shakespeare's s Romeo and Juliet, and the winds of love. "Vento d'Amore" expresses how important "movement" is to her: movement through time as well as through space. 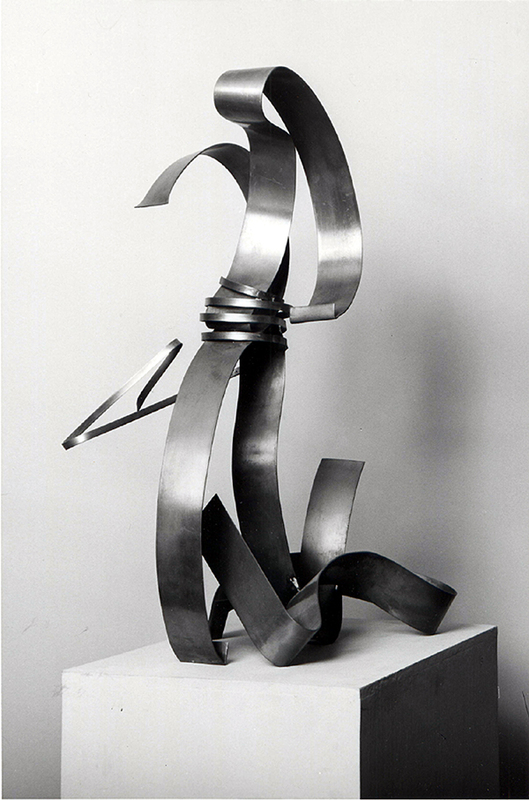 Her rounded steel sculptures attract attention with curvature, light and fluidity, such as the two intertwined figures in love. Her sculptures are abstract narratives that are sometimes whimsical, sometimes stately, sometimes delicate, always vital. Tredanari lives on Manhattan's Upper West Side and still creates metal sculptures and then builds pedestals for them. She studied with such figures as Arthur Melzer, Paul Gill, and Henry Snell, and has designed many large sculptures, including one installed at Broadway Malls in 1983 titled "Number 11 Perspectives," dedicated to Duke Ellington. In 1981, at the request of Saks Fifth Avenue, Tredanari installed 13 of her sculptures in their Fifth Avenue display windows. Her home was a salon where artist friends came to visit and talk art , drinking wine from bottles bearing the Tredanari label, produced by family vineyards. 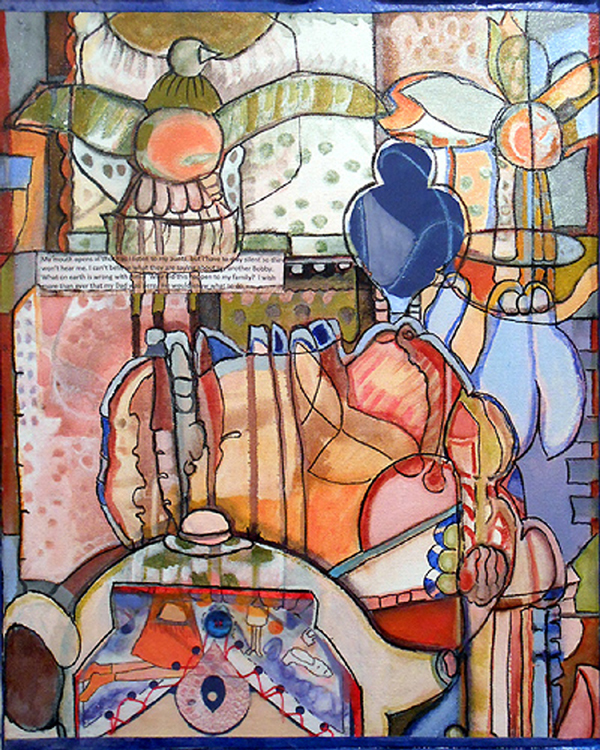 mixed media on canvas, 16" x 20"
Helene Burke of NYC has a more architectural view of narrative, with a visual vocabulary of biomorphic surrealism, descended from such painters as Miro and Kandinsky. She is an NEA fellowship recipient (1992-93) with a background in painting and found object sculpture, currently working in mixed media collage. Burke has published two children's picture books, pieces of which appear in her collages. Abstract figurative objects appear as if sleep-walking. Beginning her collages by doodling just as Miro used automatic-drawing to begin his biomorphic works, she then combines her own drawings, cut up paintings, exotic papers, pages from her books, thin layers of acrylic paint and splotches of walnut ink to create dreamy landscapes of furniture, plant forms and domestic interiors. 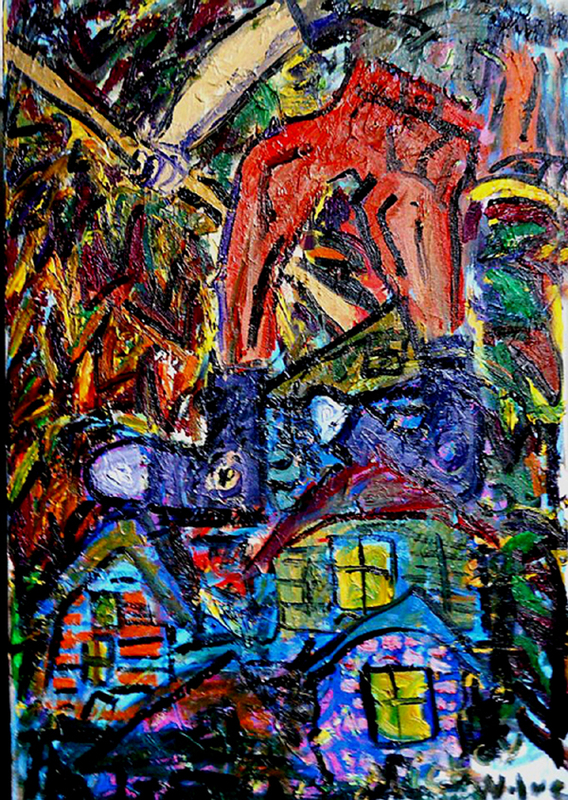 "Nephilem Invade the Little People Village"
oils on canvas, 24" x 30"
Formerly living the life of an Outlaw, Nick Grossmann went on a self-imposed exile in his mid-twenties, spending a lot of time alone, practicing meditation, learning voodoo, meeting with a Shaman, finding his truths and coming to terms with his identity. His personal experiences are the episodes that he transcribes to his painting media - his neighborhood locales, the characters of his childhood, and scenes of his travels. Growing up in Norwalk, Connecticut, he knew he was a rebel by the age of fourteen and expressed his inability to "fit in" by identifying himself as an "Outlaw". 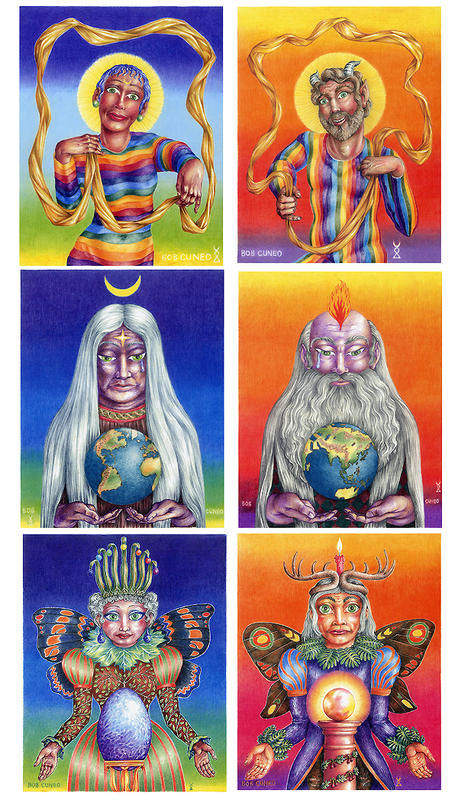 mixed media , 24" x 40"
derwent pigmented leads, each 8" x 10"
The history of the narrative art form evolves in artworks such as Bob Cuneo's visionary portrayals of six pairs of Primal Gods and Goddesses, which convey the sensation of cosmic consciousness and Illumination. In his twelve small paintings from his series "Thought-Form Divinities : Astral Images of the Great Goddess and the Primal God by a Wiccan Iconographer" Cuneo relates his symbolism and mythic pictorial imagery to the Hermetic Traditions of alchemy, pagan magic, ancient wisdom, and Renaissance story-telling. Painted in the Magic Realist style, these pairs of six divine archetypes (Dancing Goddess & God; Enchanted… ; Elder… ; Lithic…; Radiant… ; Organic…) are manifested in radiant pigment colors. Their faces gaze out to the viewer with the clear eyes of frankness, kindness, and mystery, their costume garb telling the symbolism of their place and purpose in the universe, and their roles among the other gods and in the lives of earthly men and women. 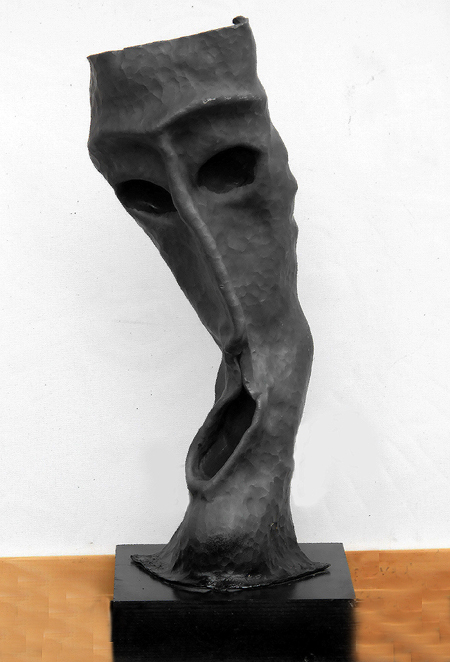 lead pedestal sculpture , 8" x 20" x 6"
Dana Baldwin Naumann's narratives are hammered out of sheets of lead into the forms of religious, mythic and archetypal figures, reminiscent of the art and artifacts found amongst ruins of an ancient civilization. His themes express compassion, humanity, whimsy, mystical and exotic sensations, such as "The Thought Just Came to Me," "The Artist as a Young Man," and "There is a Smile If You Look." Maurice Hansen "Vision of Catatonic Cathlick Medamorphics"
acrylics on canvas, 19 1/2" x 20 1/2"
The late New Haven Outsider Artist, Maurice Hansen, created an endless stream of paintings, poems, plays and videos in an elaborately quirky environment of his own making from 1960 until his untimely death in 2000 from Lymphoma at age 59. In 1993 his retrospective "Inner Visions", which included 63 paintings spanning four decades, was curated by Whitey Jenkins and held at the Aetna Center Gallery in Hartford. Outsider art critic and Director of the Benton Museum in Storrs, Sal Scalora, called it a "tour de force". This exhibition sparked the subsequent steady flow of solo and group shows which had been long overdue. His exposure over the next seven years included such venues as the Cork Gallery at Avery Fisher Hall in Lincoln Center where he exhibited his 30 foot mural of Coney Island; the Bridges + Bodell Gallery on East 7th Street where he exhibited his 25 foot mural of the 3rd International Outsider Art Fair. 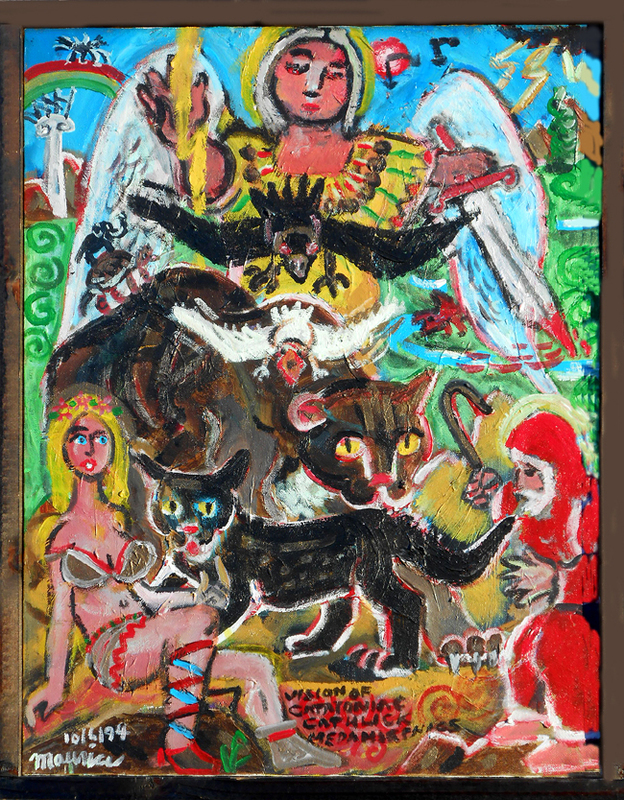 Hansen's art was also exhibited during the early years of the Outsider Art Fair at the Puck building in Soho. Reviews of his shows were featured in the New York Times, The New Haven Register, The Advocate, Art New England, Provincetown Art, Folk Art Finder and the Hartford Courant. Hansen was also included in Betty-Carol Sellen's and Cynthia J. Johansen's resource book "Self-Taught, Outsider and Folk Art: A Guide to American Artists, Locations and Resources", 1999. Maximalism began to appear as a movement in painting during the 90s in both Europe and the US, having been initiated in a catalog by filmmaker and painter Daryush Shokof of Cologne, Germany for his 1990 solo exhibition at Galleria Verlato in Milano, Italy. As a visual art form it is elaborate in design, ornate in detail and bright in color. In the catalog for that show Shokof wrote some of his thoughts on Maximalism: "Unbalancing the Chaos = Balance = Life = Maximalism" and "Life for a Maximalist means actions committed by every moving creature." A year later Shokof's "Maximalist Manifesto" began appearing in his exhibition catalogs asserting that, as an aesthetic, Maximalism "is open to wide views and visionary dimensions that can be fantastic, but not deformed". Back in New Haven, at roughly the same time, Maurice Hansen found that, to catch attention in our frenzied environment, the artist can reinforce his concepts with multiple subtexts and elaborate detail. In a captivating, wildly expressionistic style, Hansen flaunted these visual excesses as a self-proclaimed Maximalist. 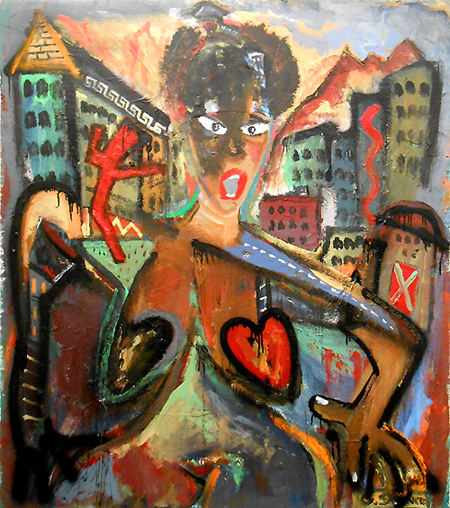 In a 1994 exhibition at the York Square Cinema Gallery in New Haven, "Castles, Kings and Carnivals; The Maximalist style of Maurice Hansen", the artist displayed his fully developed philosophy, vision and style. Maurice Hansen's starring role was as a painter of narrative. Through decades of painting Biblical subjects as well as contemporary cultural and political events, Hansen took the art of visual narrative to a whole new level. One of his better known paintings "Starry Night of the Kingdom Come" (property of Beverly Kaye Gallery) is an apocalyptic vision which depicts an extravaganza of cultural icons and religious references interwoven with subplots and miscellaneous annotation, and which ironically result in a painting that celebrates life. Gallery Hours: Thursday thru Saturday, 1 to 6 PM. Exhibition thru March 3, 2013.